Camping in sub zero temperatures…would you? That’s exactly what we did in Dorset this winter and we can’t recommend it enough. We were invited to review Caalm Camp near Shaftesbury – a former dairy farm turned luxury glamping site with views of the rolling hills by day and a dazzling canopy of stars by night. Not only is the natural setting beautiful, the owners have worked hard to make this a premier glamping experience. Set aside thoughts of dripping canvas and long walks to muddy toilet blocks. Caalm Camp claims to put the ‘glam’ in glamping and we believe it hits its mark. Here’s our experience of luxury glamping in Dorset. The top question we’ve been asked since returning from Caalm Camp has been: were you cold? And we can honestly say we were not! Caalm Camp has created a camping scenario where cold does not have to feature, even during one of of the chilliest Decembers I can remember. We arrived as the sun was setting and the outside temperature was dropping. The friendly owner, Mark, saw us pull up outside the farm house and came to greet us. 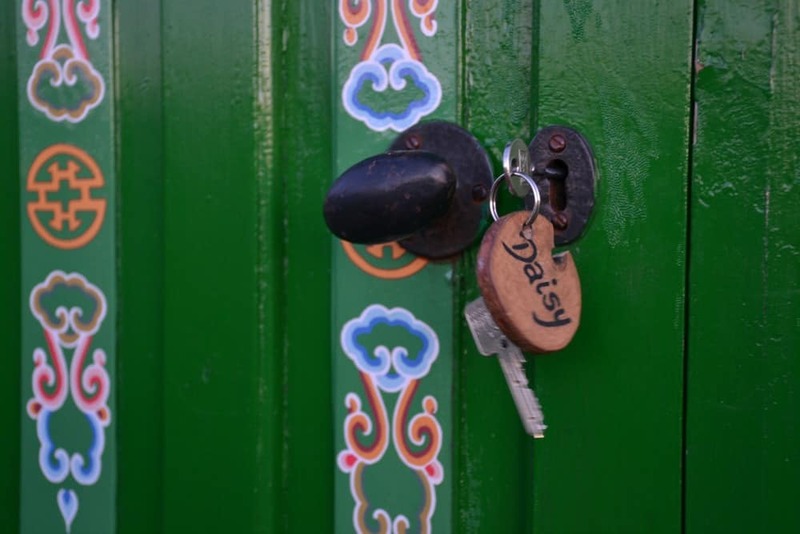 The camp has been family-run for six years, offering a rural retreat close to the borders of Somerset and Wiltshire. Our accommodation was a traditionally built and hand-painted Mongolian yurt with a wood burning stove to keep us toasty warm. The wooden lattice structure was held together with camel hide ties and horse hair string, and the beams were intricately decorated. It was beautiful. Your stay at Caalm Camp includes all the chopped fire wood you can burn, so there’s never any need to let the fire go out. And if you’re really keen to keep the flames burning all night you can buy a bucket of coal (£3) to avoid having to stoke the fire in the early hours. 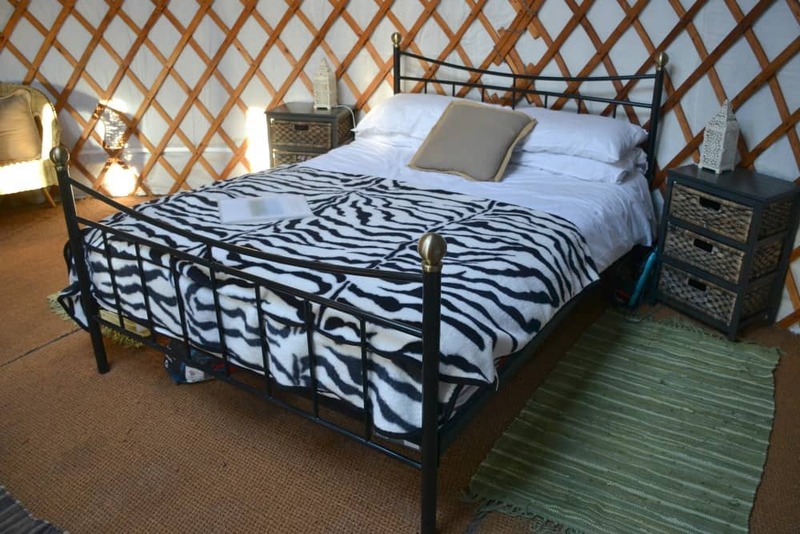 Each yurt sleeps up to six people in two day beds and a double. These beds were as comfy as at a hotel and there was no need for extra bedding. 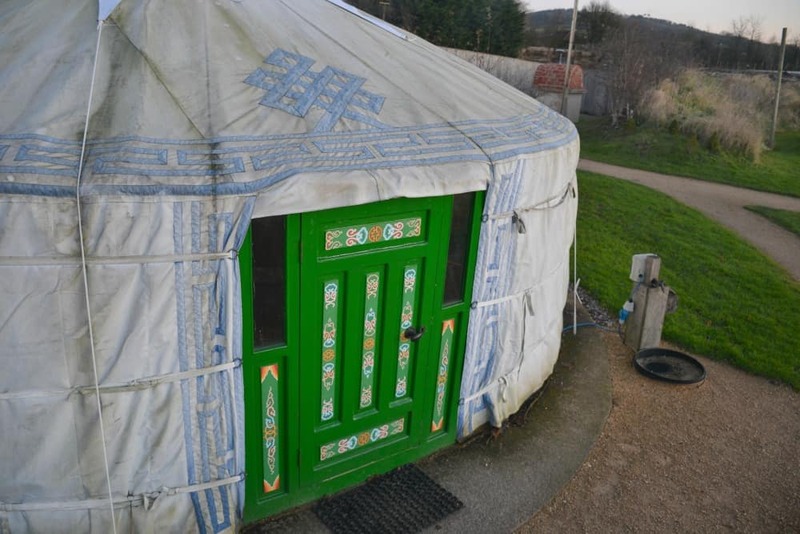 Speaking of hotels, there was more space and plug sockets in our yurt than in some hotels we’ve stayed in. The free wifi was also in good supply. ‘Daisy’ is the closest yurt to the Old Hay Barn where the wifi signal is guaranteed. Mark explained it was less likely to reach to other parts of the site, so ask for Daisy if you prefer to stay connected during your break. We also had a small kitchenette with an induction hob and kettle to make hot drinks, a washing up bowl and barbecuing utensils. A feature we loved, but that could be a pain for kids and light sleepers in the summer months, was the skylight. It was not an issue for us in December but don’t forget your eye masks if daylight could play havoc with your holiday lay ins. Outside we had a picnic table, water tap and our own fire pit that we sat around at night toasting marshmallows and spotting shooting stars in the glittering skies above. Once the girls were in bed Mr Tin Box and I took great pleasure in cuddling up under some blankets where we did our best to name the constellations. Every now and again we’d be distracted by the ghostly shiloette of a barn owl or bats winging their way to roost. 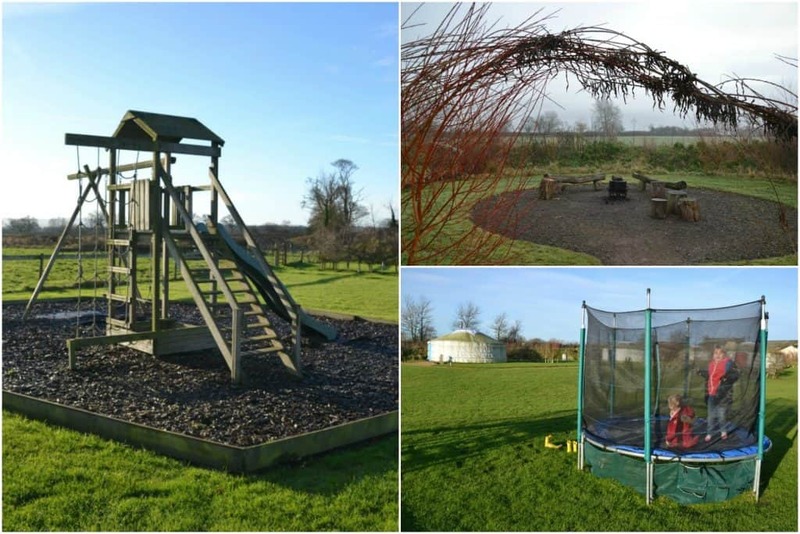 In among the yurts there are shared social and play areas including deck chair seating which is covered by a sail canopy in the summer, a communal fire pit, and small wooden play area with trampoline. Each of Caalm Camp’s yurts has its own private wet room in the Old Hay Barn, which is also equipped with a shared kitchen and dining/living room. Perfect for a winter camping break with all the frills! In the communal kitchen we had our own fridge and food cupboard, crockery, utensils, cutlery and cups. There were two shared hobs and ovens, and a microwave. In the other cupboards there were plenty of pots, pans and cooking dishes. In the summer I expect the kitchen gets used for little other than food preparation and washing up as each yurt has its own charcoal barbecue. There’s also a pizza oven that the owners hire out for pizza nights. The indoors dining and living area has six sets of dining tables and chairs, two sofas, books, DVDs and two baskets of toys. 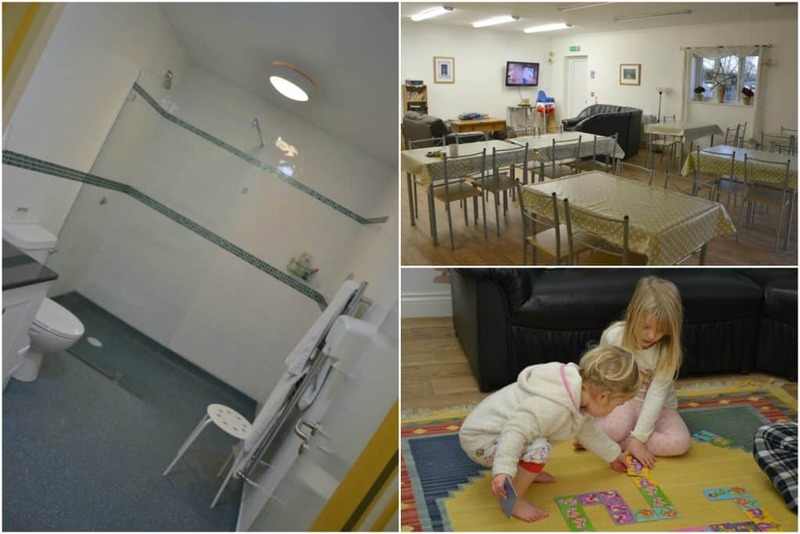 We used this space to keep the kids entertained while we prepared food and had showers. We also had use of a well-stocked utility cupboard with a washing machine (pay a few pounds using the honesty box), dust pan, brushes, pegs and a baby bath. The private wet rooms are genius. It’s never really occurred to us that trips to the toilet block could be made easier if we had our own bathroom where we could leave towels and toiletries. It’s such a simple but brilliant idea for a glamping experience. Each wet room as a sink, shower, toilet, heated hand rail, underfloor heating and hand dryer. Towels, hand wash and a couple of toilet rolls are also supplied. A bonus feature in the Old Hay Barn is a covered games area with table tennis, pool table and two friendly goats to pet. It’s a good space for older kids to hang out. There are highchairs in the dining space. There’s a handy guide to local attractions in the Old Hay Barn. We visited the Haynes International Motor Museum, Fleet Air Arm Museum and Longleat Safari Park, which were all within an hour’s drive. 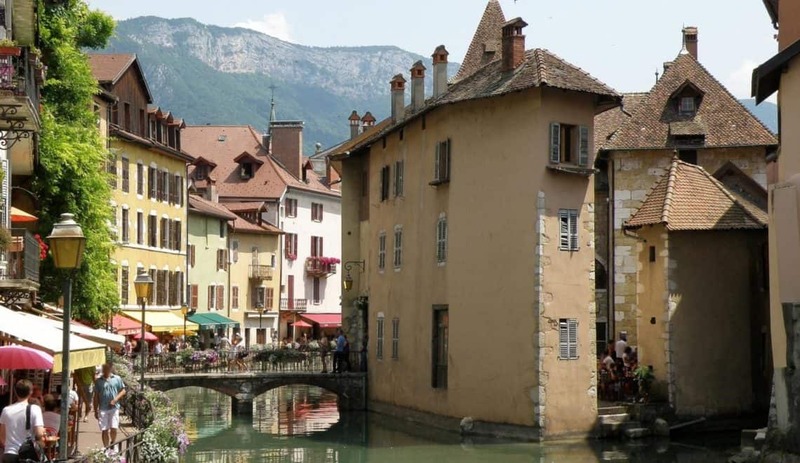 If we’d been staying longer we could have easily filled several more days with sightseeing. 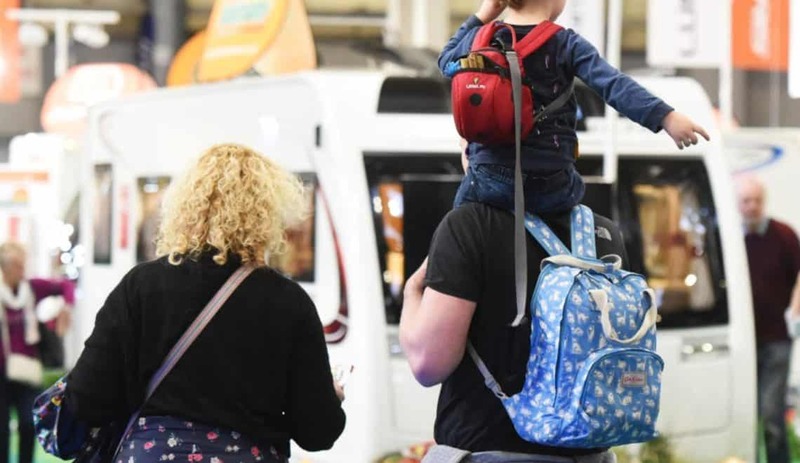 Stourhead Park, the Tank Museum, Swanage Railway, Lulworth Castle, Monkey World and Wookey Hole are all great attractions close by. We had a very special winter break at Caalm Camp but can see it would be a perfect luxury glamping experience whatever the season. The combination of the beautiful yurts, quiet countryside location and extremely well thought out facilities made it a winner for us. 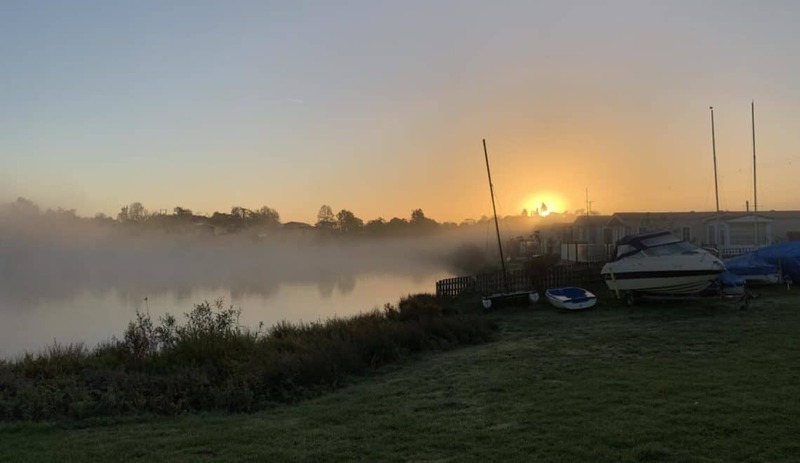 If you enjoy camping and outdoor holidays and are looking for a five star experience or want to give glamping a go for the first time, Caalm Camp is the ideal place to book. Fin out more about prices and availability on the Caalm Camp website. Have you even been glamping in winter? What was your experience? Disclosure: we were invited guests of Caalm Camp. We were asked to stay in return for a review on the blog. All opinions are my own and those of my family. Leona recently posted…Our most popular posts of 2017 and what to expect in 2018! We don’t usually mind too much – its just part of camping. But it was a revelation to us to have our own bathroom space. A huge bonus! Oh they are SO cosy! And that painted woodwork is beautiful. I actually have a secret wish to one day live in a yurt. Houses are over-rated. This was really baby-friendly, aside from the potential they could get to the log burner but you can put things in front of that. I couldn’t believe the amount of power points! It was a true glamping experience! OOh these look so cosy!! I love places that don’t allow cars onsite and kids can just run around safely. Its great to be able to give them some freedom isn’t it! Absolutely! That’s something that they’d thought a lot about. There’s only one gate into and out of the yurt complex so unless the kids go through that you know they are around somewhere. It makes for a proper break for everyone, not having to keep a constant eye on kids who want to explore! Great to hear you found it useful. 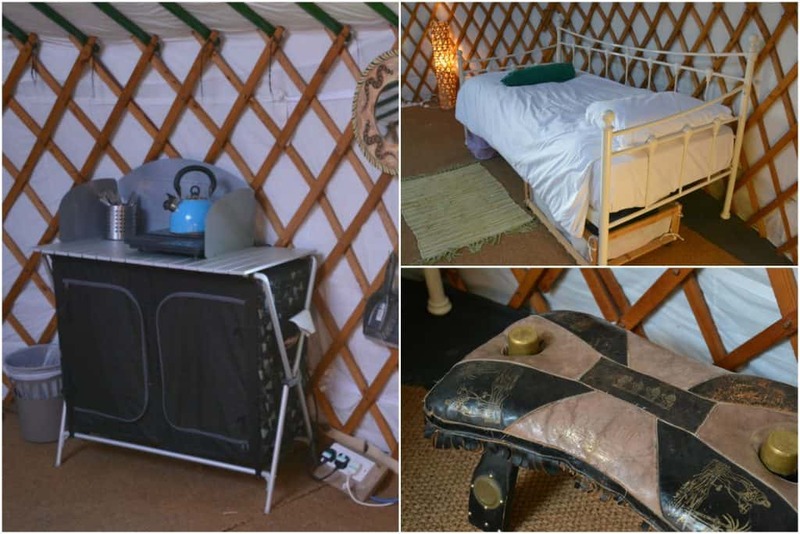 Do your research as not all yurts are the same in terms of what they offer. Some can be much more basic. Not everywhere is like this so do your research. This is definitely somewhere we can recommend as being snugly warm in the winter! Ohh.. I love this. I really have the itch to go camping but I’m not brave enough to deal with the weather right now. This looks like a perfect solution & I love all the little details like the skylight and painting. What a fun experience. Totally agree! 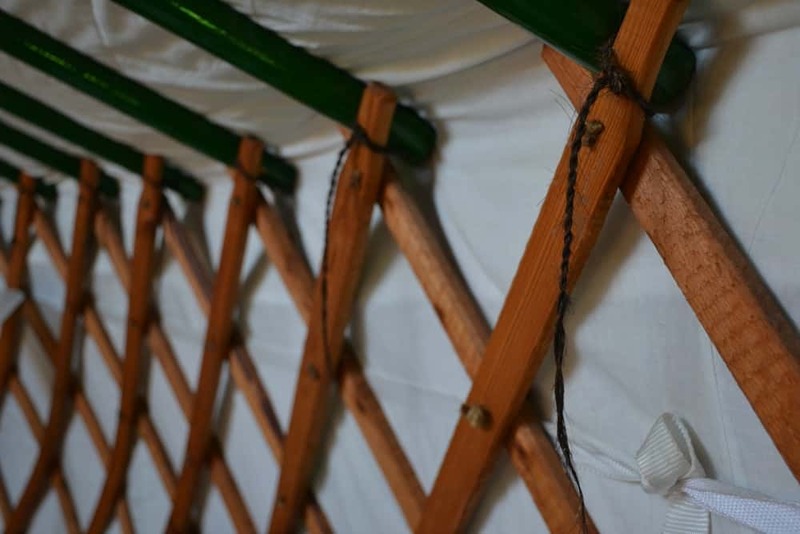 Snuggling down in a yurt is an experience I think every young family should have. These look SO glam too! Glad to hear it Maggie! 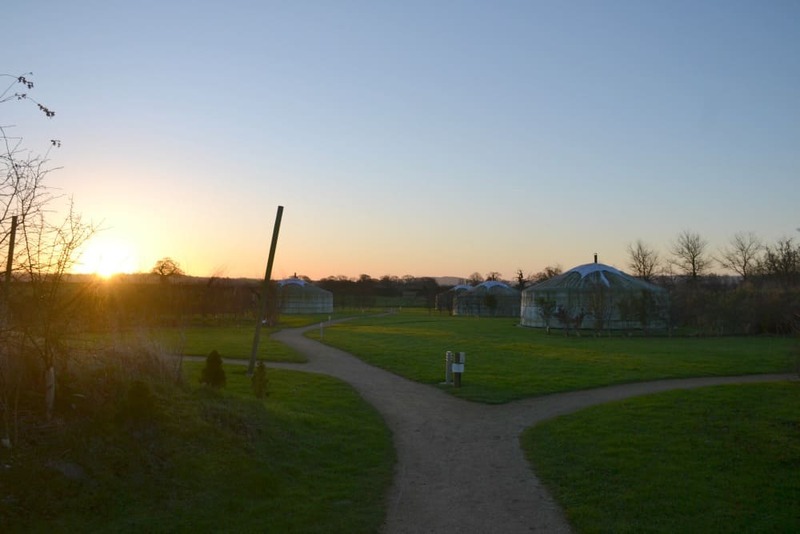 We stayed in a really similar Mongolian Yurt in Somerset and it was magical and warm! Love your video tour. Thanks Penny. They are wonderfully warm aren’t they. 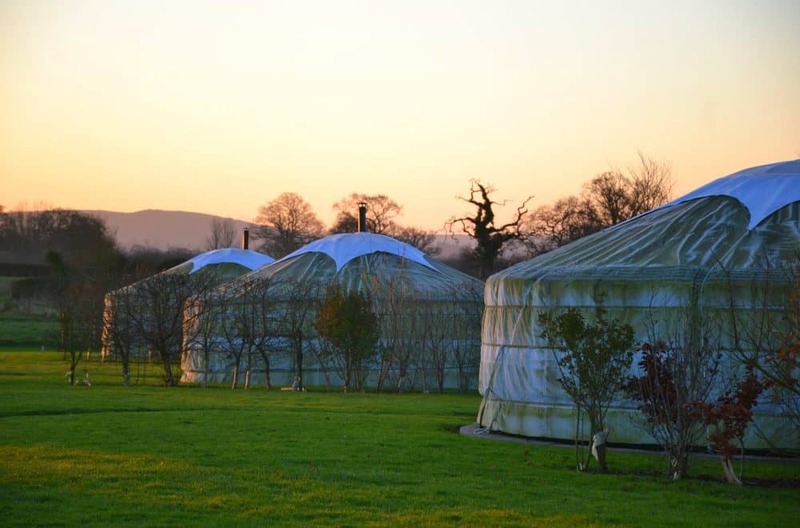 We’ll definitely be staying in a yurt again! It seems like incredibly luxurious camping although I’ll believe it when I see it, with Sarah camping! Glad you found it useful and yes, you must do both! The thought of being cold and having to share a shower block are two of the things that put me off of camping most! This looks like the perfect solution for me – the individual wet rooms is a genius idea!